Well, in late November my laptop started acting bizarre. That led to getting ridiculously behind in EVERYTHING. Add in the holidays and the beginning of Eli’s wrestling season and, well, it has been weeks since I surfaced here. The good news is I have been VERY busy and productive, so now it’s time to start sharing. And since “enter shows” season begins, I have drafted up a new, freebie PDF on how to make a hanging sleeve properly. 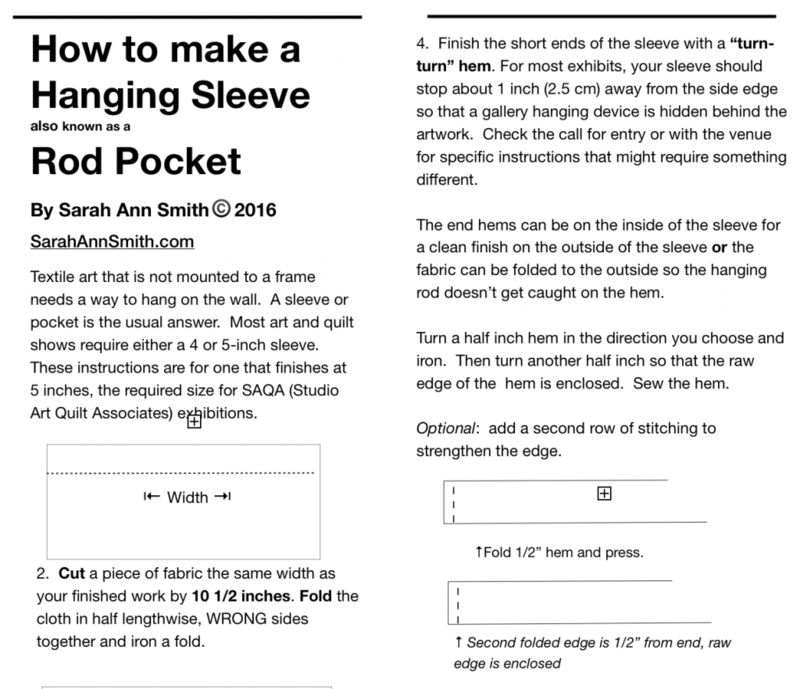 You can download the Hanging Sleeve–PDF, and it is also listed in the “Tutorials” section of my Resources page which is here. A quick peek at my new PDF on How to Make a Hanging Sleeve–click on the link above to download the complete instructions. Guilds, shows and shops have my permission to download and reproduce this handout as long as it is downloaded in its entirety, nothing is changed, and credit is given to me with a link to my website. In other words, something like “How to Make a Hanging Sleeve by Sarah Ann Smith, www.SarahAnnSmith.com.” And I’m pretty sure it will in the not distant future be available on the SAQA website, as well. I’ll update this post if/when that happens. Given the way my life goes, I can’t promise I’ll be back soon, but I sure hope to try! 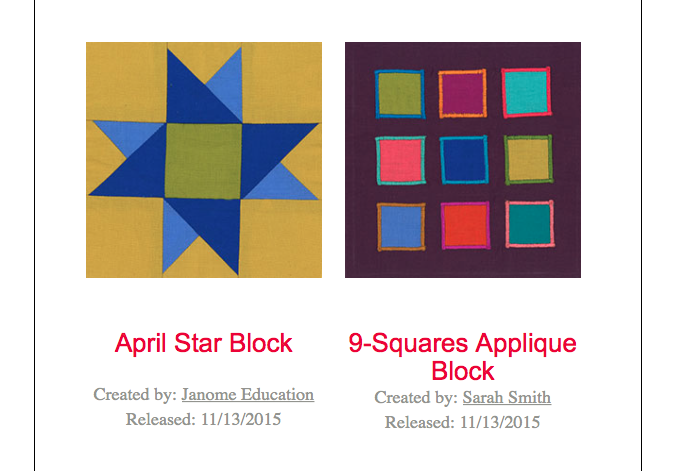 To get a PDF download with the instructions for my 9-squares blocks, click Sarah’s 9-squares block. I am really enjoying seeing the blocks come to my inbox every day. Just click on the hotlink in the first sentence and follow the links/instructions to sign up for notifications (optional) or just get to the PDF instructions. 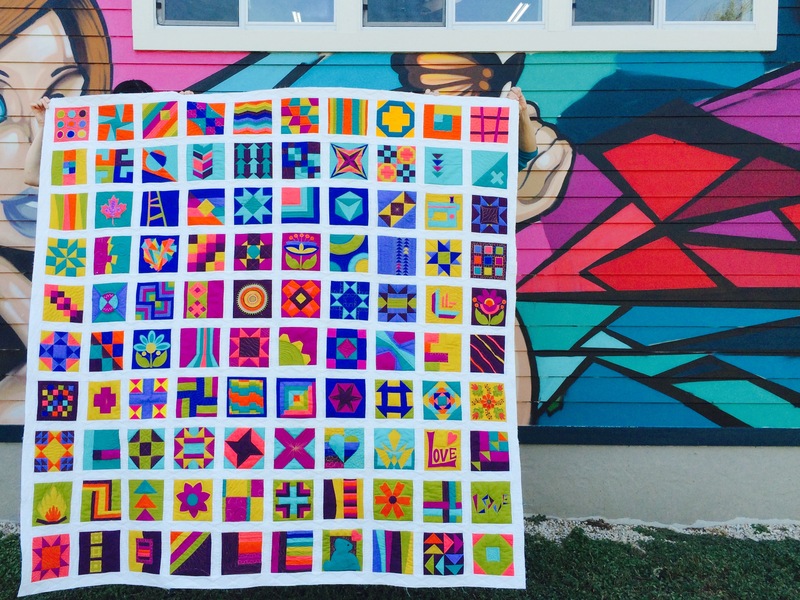 Doesn’t this quilt look fabulous photographed against that colorful wall? My blocks are the first one ( nine circles, Row 1, top left), Row 4 last block (the nine squares), Row 5 (bulls-eye with decorative stitching in the center…will publish next week), Row 6 (last block, wavy inserted skinny strips), Row 7 first block (mini checkerboard) and Row 7 rainbow log cabin in center). I’ll announce each time my patterns post. Right click to view larger. 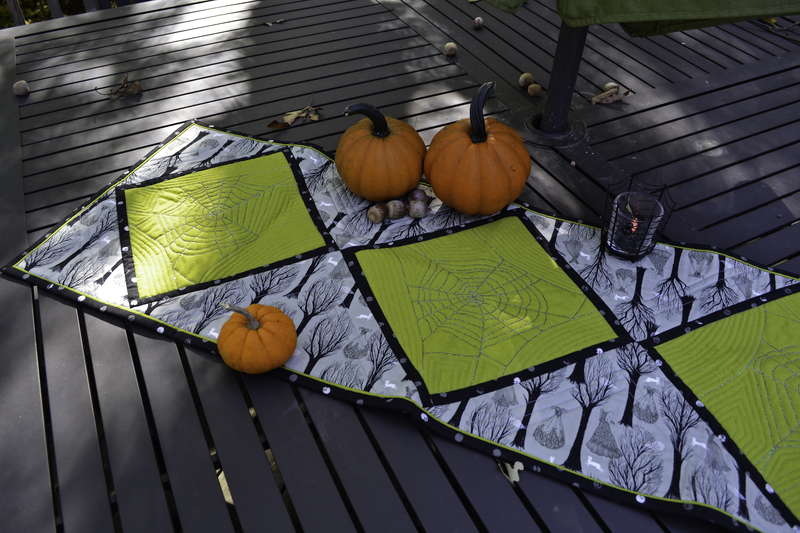 Spiderweb TableRunner Free Pattern for Halloween! This tablerunner was featured at the Janome Institute late this past summer and it is now featured on their blog, here (scroll to October 15, 2015) and here on their projects page. And I’m sharing the pattern with you here as a Halloween Treat! 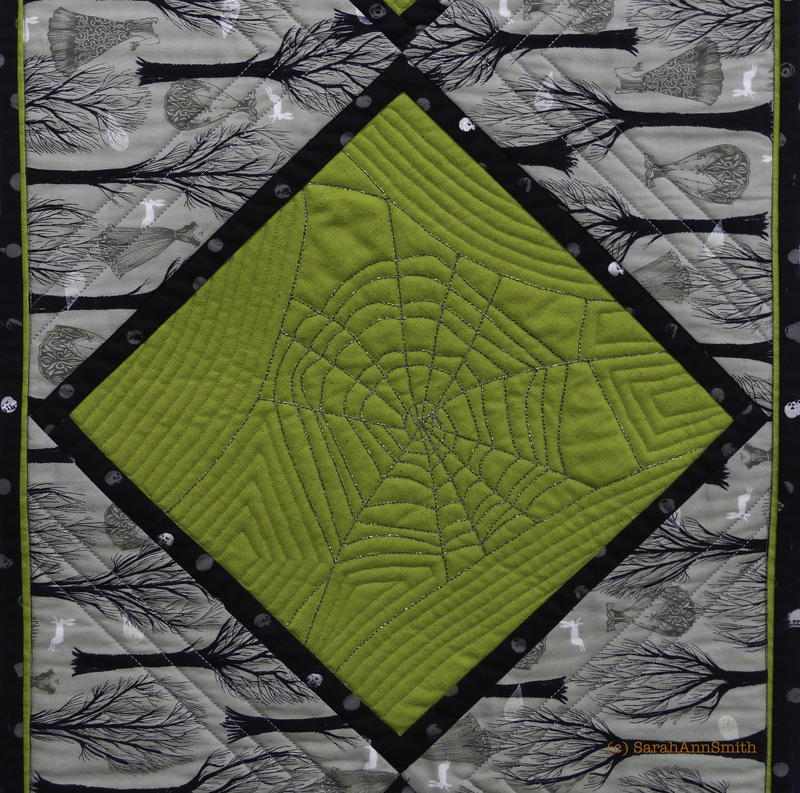 Spiderwebs table runner (c) Sarah Ann Smith 2015. Featured on the Janome America website/blog on October 15, and on Sarah’s blog. Photo (c) Janome-America; used with permission and thanks! For many years now I’ve been fortunate to be associated with Janome America. I have been sewing on their machines since late 2004, moving up the product line so I’ve had a chance to test machines at all levels. And in about a week I will review here my test-drive of the reasonably priced Skyline S7, a brand-spanking-new machine (and to spill the beans–I can’t believe how much you get for the price!). Anyway, I occasionally do projects for Janome. Although this tablerunner was made on a top of the line Janome 15000, all you need is a machine that does a straight stitch. If you have the triple-straight-stitch also, that’s good because it gives you a “bold” line on the spiderweb, but it isn’t necessary. Even the most basic sewing machines (as long as they are not straight-stitch only) have this stitch (look for three vertical lines next to each other). Most of my work is very involved and advanced, and the projects Janome features tend to be easier, so I drove down to one of my favorite local shops, Alewives Fabrics (here). I found the fabulous Halloween fabric, and I’m not usually a major fan of decorating for this holiday. But I love the ghostly dresses and the “polka dots” on the black that are really little skulls! I also adore spiders (anything that eats mosquitoes is a friend of mine) and spiderwebs. The green cotton-linen blend was perfect! Detail of the spiderweb block. Spiderwebs for Halloween Table Runner is the PDF for the pattern (also available on the Janome projects page, see link above). Yep–this is a total freebie, including a full-size page of the spiderweb design which, of course, doesn’t need to be just like mine! A friend had a great idea which I wish *I* had thought of: to include a line of glow-in-the-dark thread with the stitching on the web! If I were to make this again, I would feed the two threads together as if one (Thanks Lutra!) through a large needle (size 16 or maybe even 18) to do the spiderweb stitching. 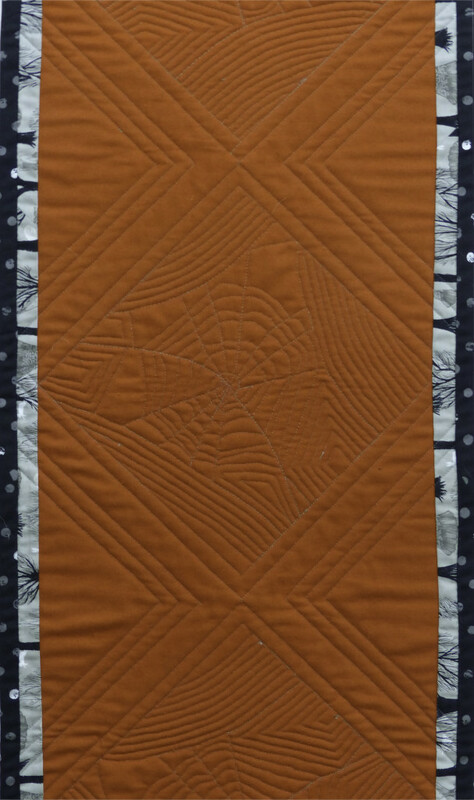 The quilting on the back of the tablerunner, so it is reversible if you want. 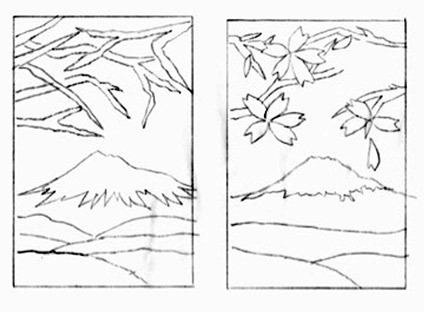 The fabric requirements on the pattern are SCANT–they are what I had, and I used every tiny little bit! If you find you need to square things up a lot, buy a little more than I suggested. An extra thanks to Taylor D. and Janome America for letting me use some of their photos (the nicely staged ones on the table)–I forgot to take nice photos before I sent it off to them for Institute! And as always, thanks to Janome for having me in their Artist-Teacher program for so many years. I truly appreciate it–and best of all, for making such great machines. Yes, I’m affiliated, but I’d say the same things if I paid full MSRP! 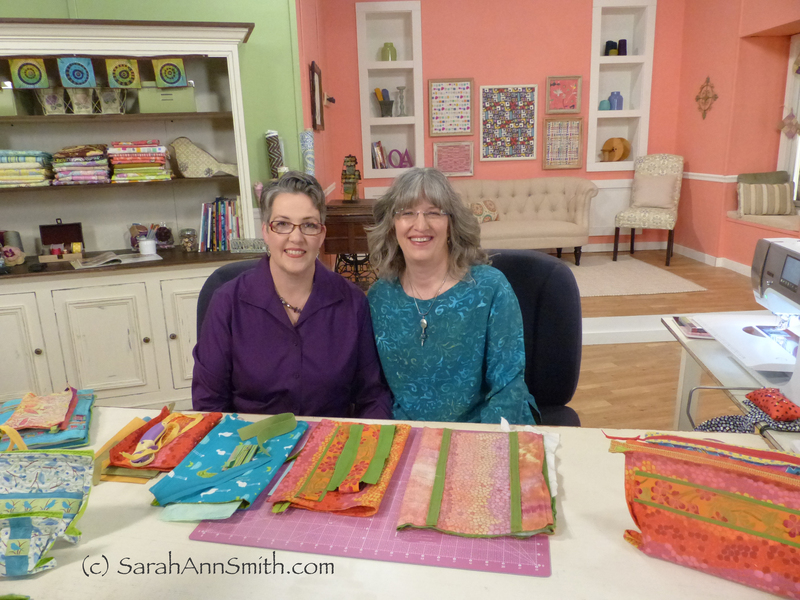 If you watch Quilting Arts TV, these may look familiar, as they are on one of my episodes in season 1400 AND were in the 2014 Quilting Arts gifts magazine. I believe you need to have an Interweave/Quilting Arts account, which is free, to download theses freebies. Enjoy! Sorry it has taken me this long, but now it is here for all eternity or until the internet (I hope not!) implodes or is followed by something else even more amazing and wonderful than cyberspace as we know it today!